Getting ready for Easter and want to decorate your home for the occasion? 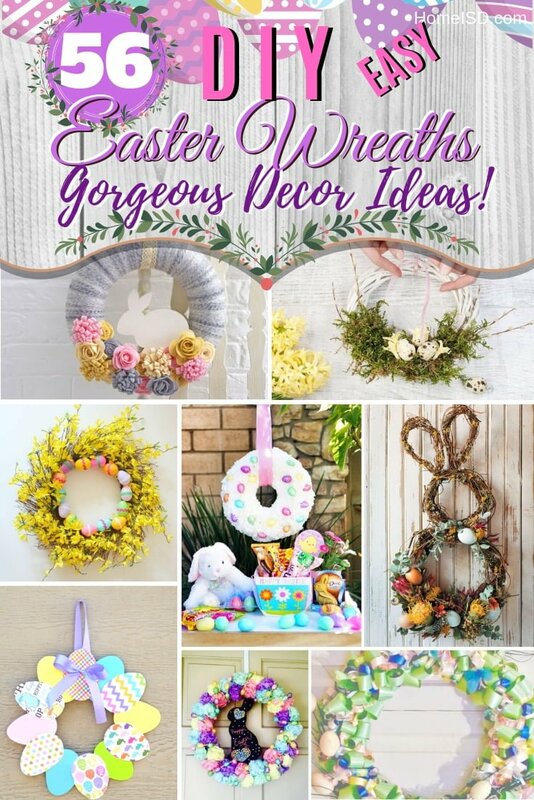 It all starts with an Easter wreath – here are 56 ideas to get you started! For many, Easter and the season in which it falls represent a period of hope, renewal, and cheer. After a long winter, we are ready to see beautiful flowers and other manifestations of nature that cheerfully announce that spring has sprung. Home decor also plays a vital role in the celebration of the period. 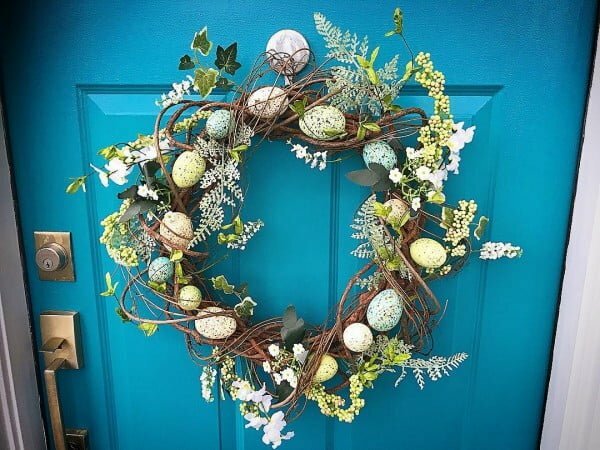 A DIY Easter wreath provides a great way to greet individuals entering your home and help to get them into the spirit of the holiday. 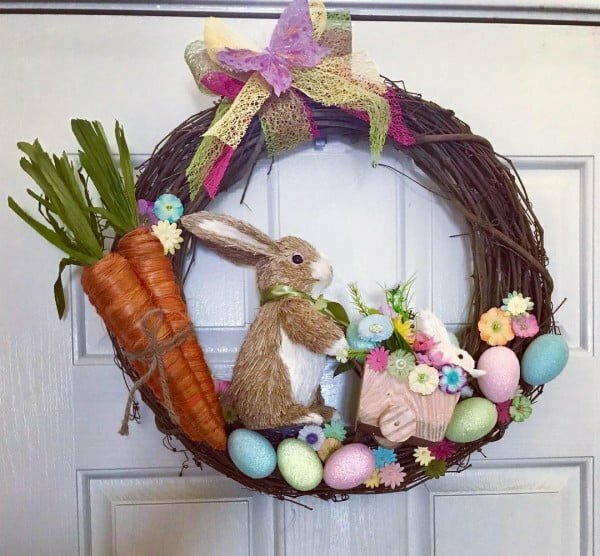 One of the best things about wreaths is that you can make an inexpensive one that reflects your personal preference and fits in with the overall Easter decor of your home. 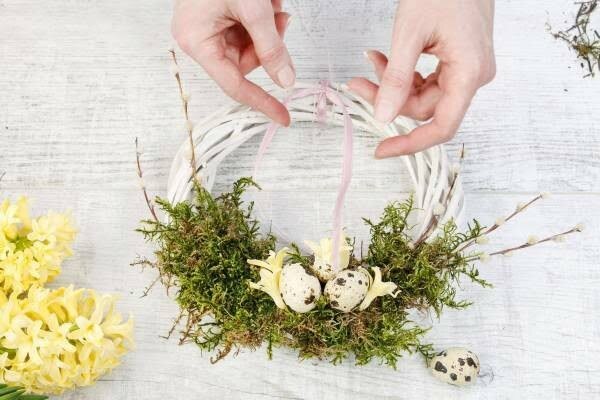 Below are 56 DIY Easter wreath ideas that can be used to beautify your home and inject some festivity into your decor. Check out the most beautiful Easter centerpiece ideas. 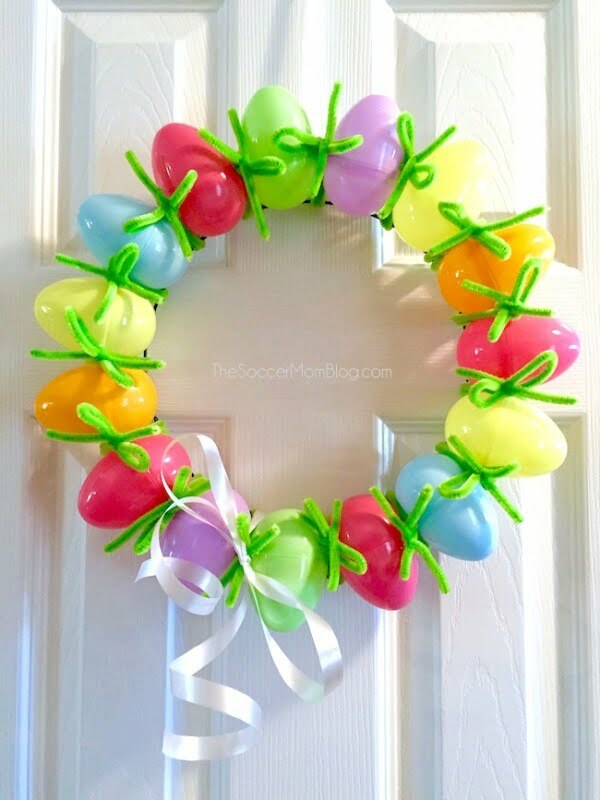 This is an awesome DIY easter wreath (kid-friendly craft) the easy way. See this website to get the complete guidance. This lima bean wreath is just perfect when it comes to Easter wreaths. Check out this website for the full guidance and instructions. 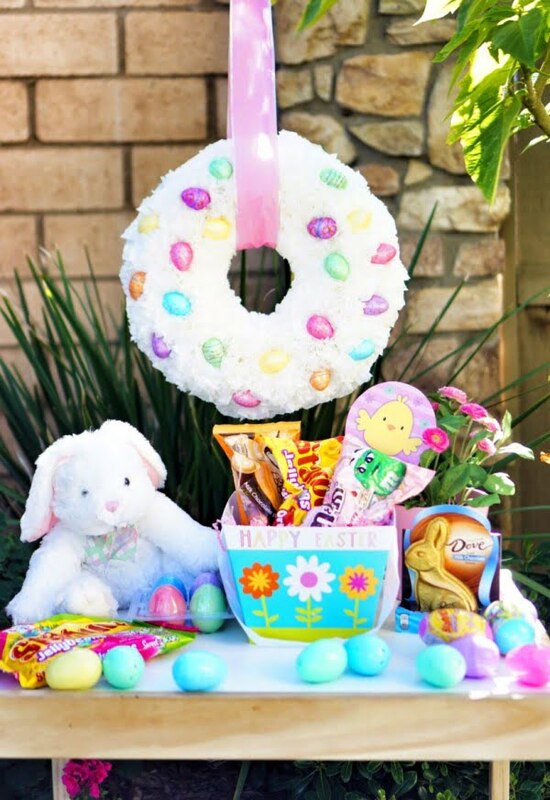 Make this DIY Easter Egg Wreath with items from the dollar store. 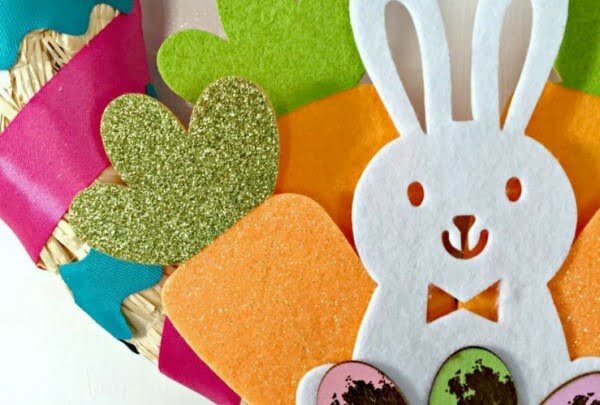 You will love these simple Easter decorations and Easter egg crafts. See the link to see the entire details. Decorate your home this Easter with this fun bunny head Easter wreath made out of kidney beans. 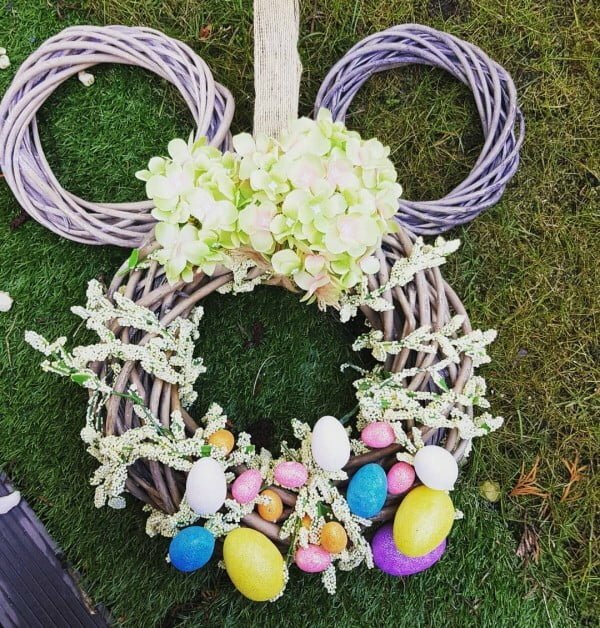 This simple minimalistic Easter wreath is unique and easy to make with items found around your home. See the link to learn how to do it. This is a wonderful DIY coffee filter easter wreath on a budget. Read the link to find out how to do it. We love a good wreath, especially one that is holiday themed. 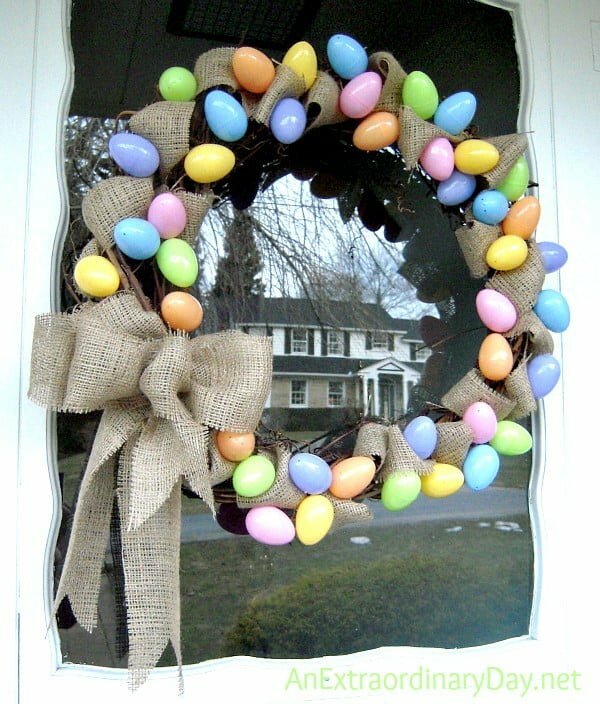 Here are step by step instructions on how to make your own Easter themed wreath for your front door. Read the article for the full guidance. 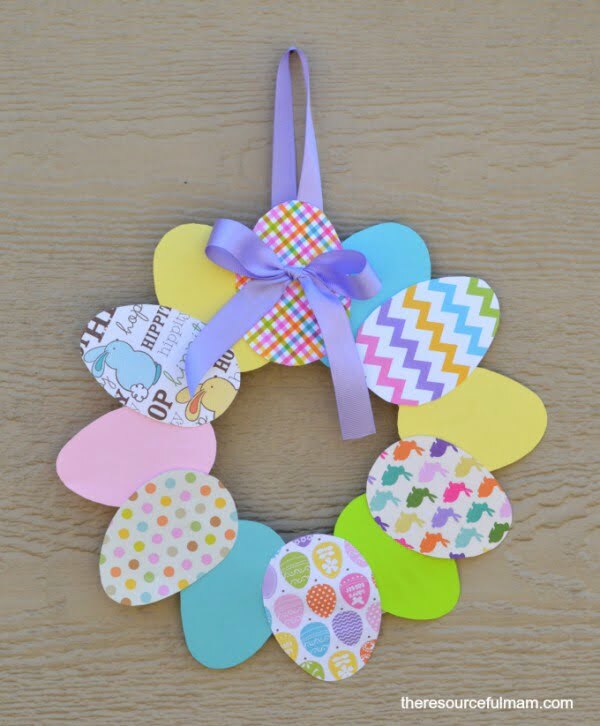 Learn how to make a cute and colorful DIY Easter wreath with budget-friendly supplies. 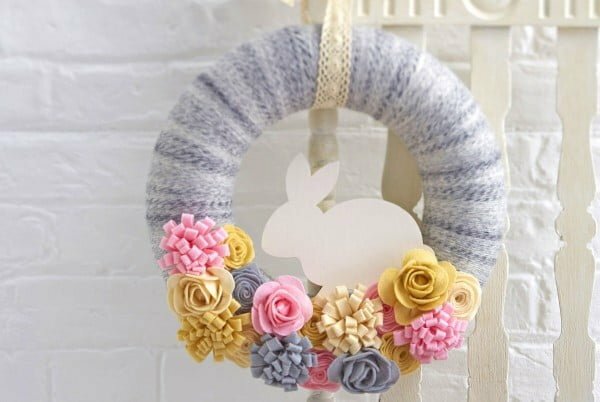 You can make this Easter Bunny wreath in just 15 minutes. See this website to learn how it’s done. 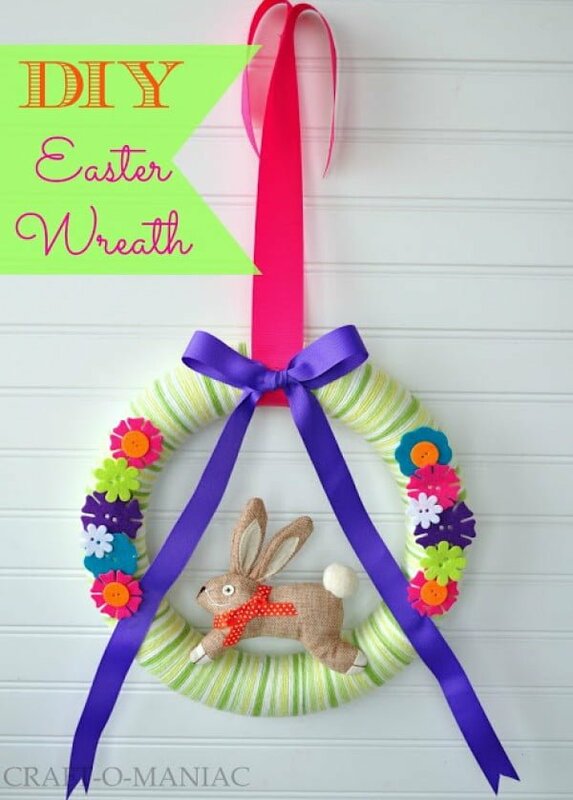 What an amazing DIY Easter bunny wreath you can replicate the easy way. Read this website for the full guidance. 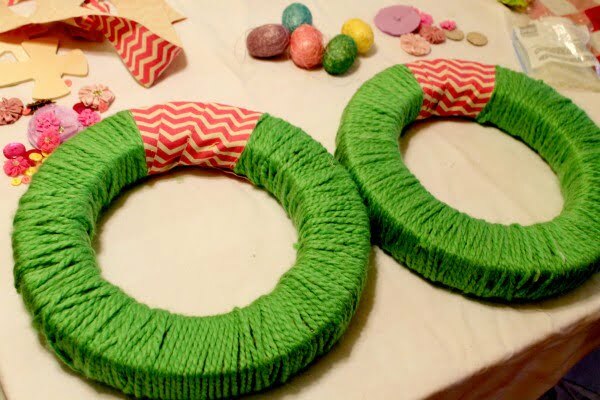 Decorating for Easter is effortless when you have this DIY wreath at your disposal. 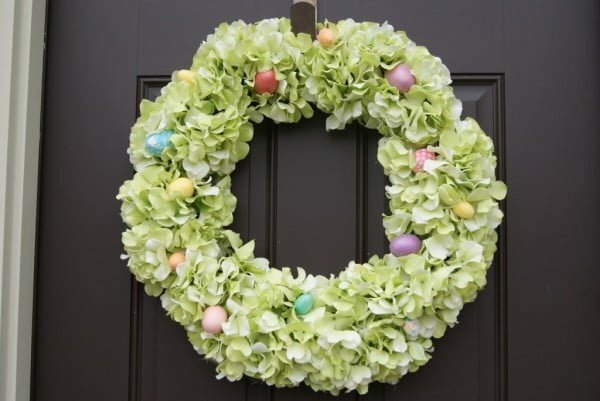 The Easiest DIY Easter Wreath is the simplest way to add a touch of spring to your front door. Read the link to get the entire guidance and instructions. DIY Easter Wreath made with yarn! 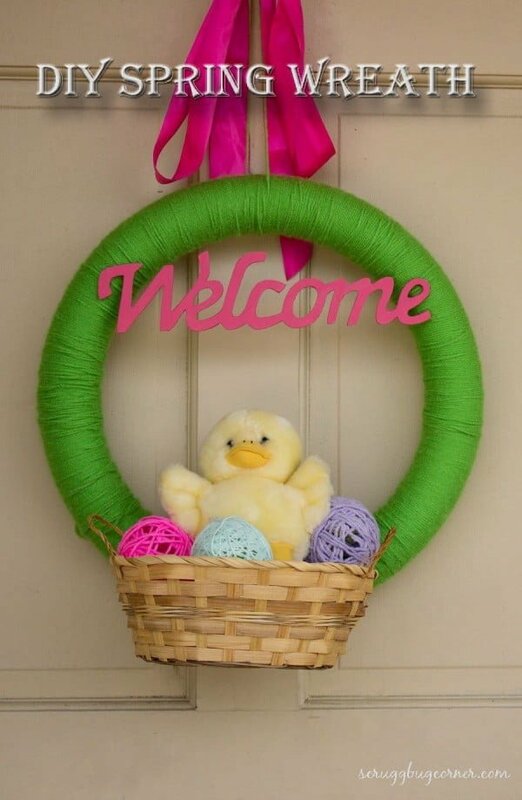 This easy Easter Wreath is made with a foam form, little basket, and a stuffed spring duckling. Check out the link to find out how it’s done. 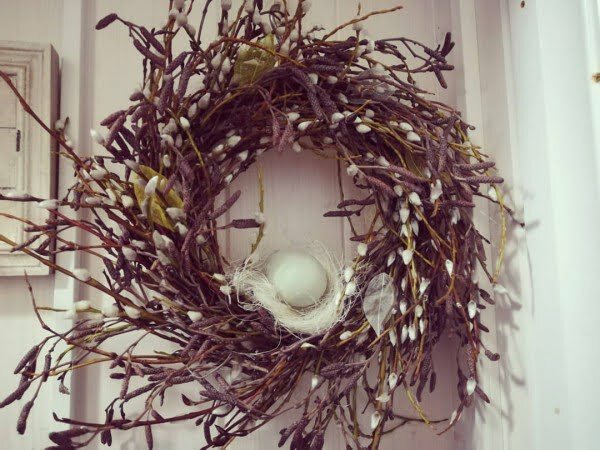 This DIY Easter Wreath is an inexpensive, easy-to-make twist on the classic grapevine wreath. Read the tutorial to learn how to do it. 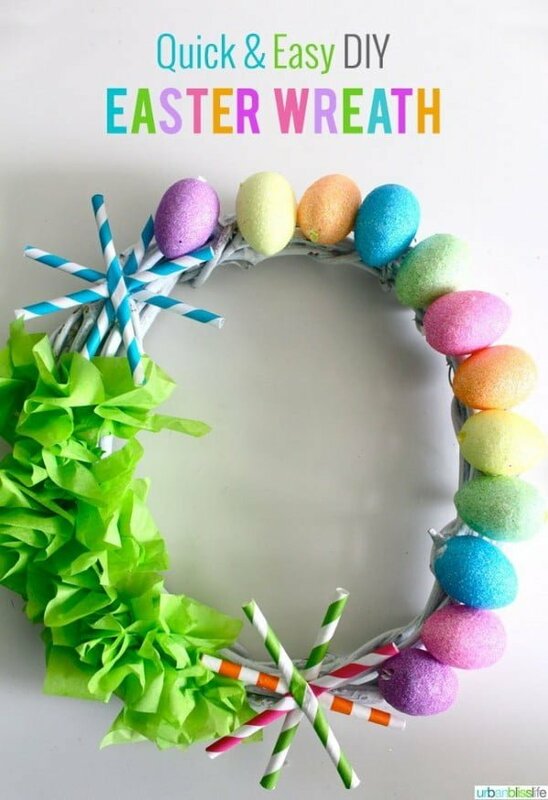 Build this easy DIY Easter wreath tutorial on a budget. Check out this website to learn how to do it. 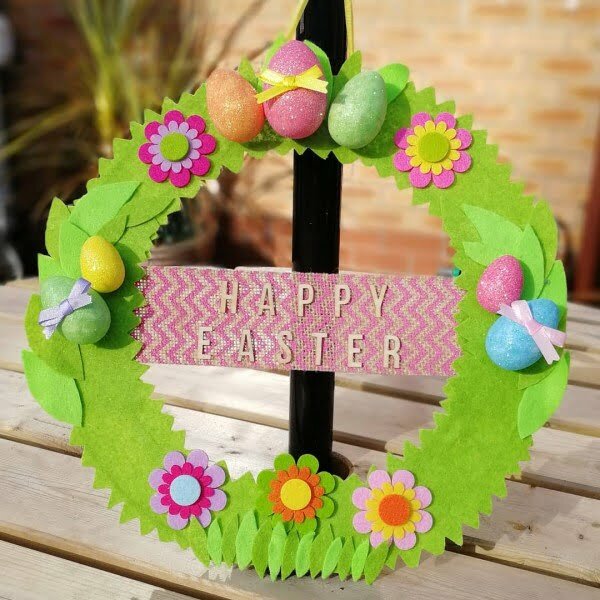 There is so much you can do with a felt sheet, this pretty Easter wreath uses felt sheets to create beautiful floral blooms to decorate your very own wreath, perfect for spring or Easter. Read the article to see how it’s done. 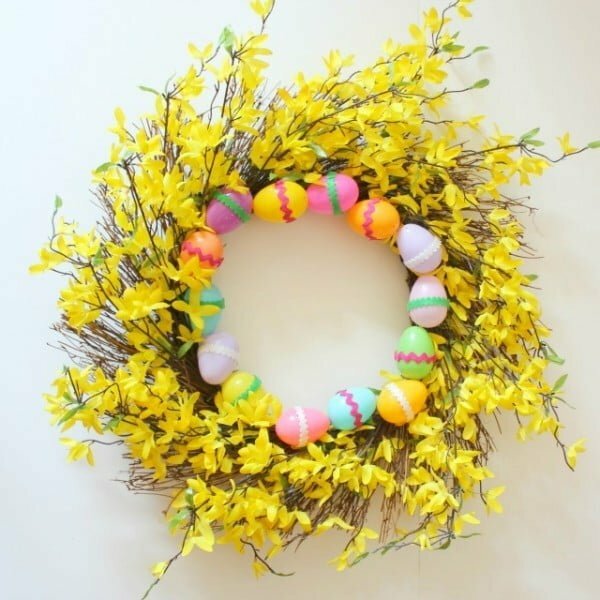 What an awesome bright and cheery DIY easter wreath you can replicate the easy way. See the link to see how to do it. 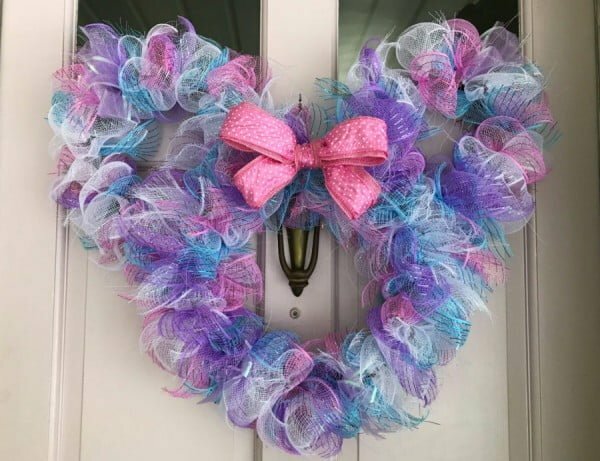 Glitter, ribbon, and butterflies make this DIY Easter Ribbon Wreath (and tutorial) perfectly light and airy for all things Spring. Read this website to see how it’s done. 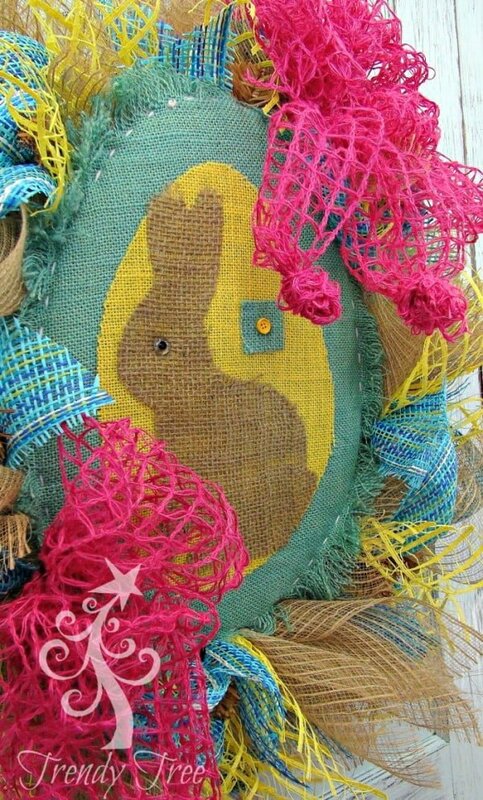 DIY Easter wreath tutorial using light brown work wreath, poly jute mesh, cotton windowpane mesh, burlap ribbon, paper ribbon and Easter wall hanging. Read the article to find out how to do it. 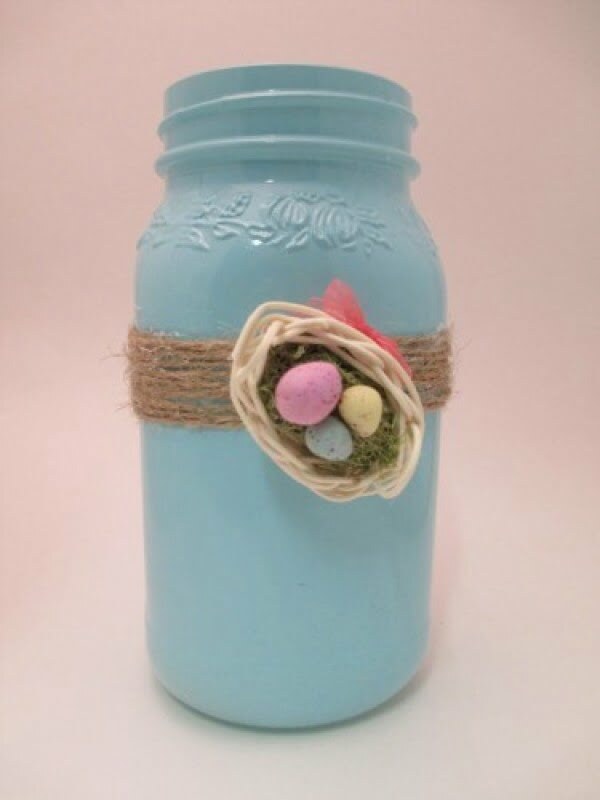 Create the DIY Easter wreath and vase you can also make the easy way. Check out the article to see how to do it. 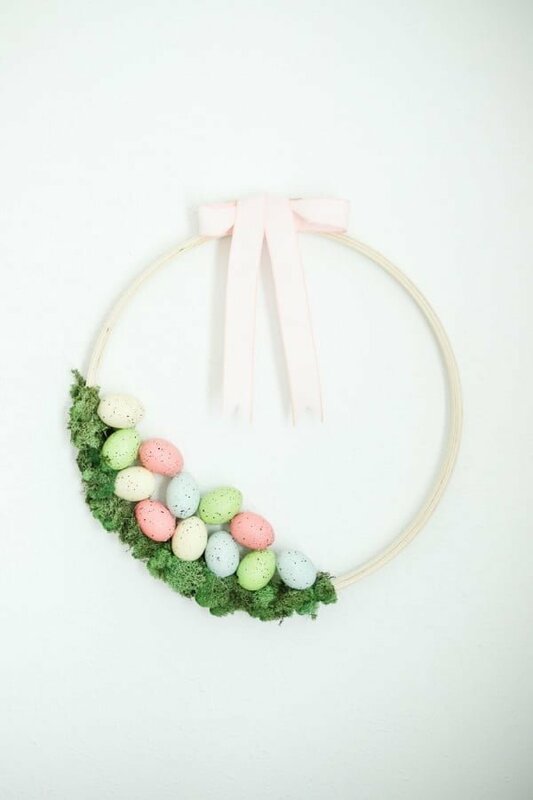 This Easter wreath is adorable and sweet, you can hang it on a door or lay it flat for an Easter table centrepiece. Read the article for the entire details. This tutorial for this DIY Paper Easter Wreath is the perfect DIY to get in the spirit of the holiday. Follow the link for the entire details and instructions. Did you know that it’s super easy and inexpensive to make an adorable DIY Easter Rag Wreath for Easter? All you need are a few simple supplies, a little bit of time and the ability to tie a knot. Read the article to find out how to do it. Spring Easter Egg Wreath made with regular plastic eggs wrapped in yarn, a little floral grass, and hot glue. Add some color to your door to welcome spring. See the article to get the entire plans and instructions. 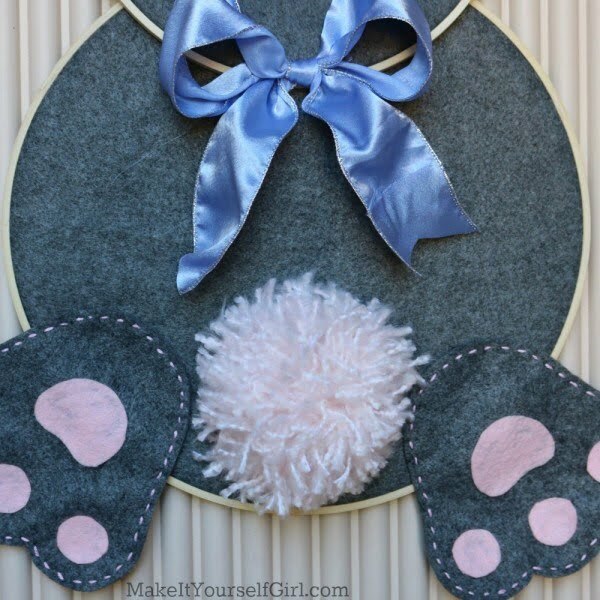 Learn to make an adorable bunny Easter wreath with an embroidery hoop with this clever tutorial. 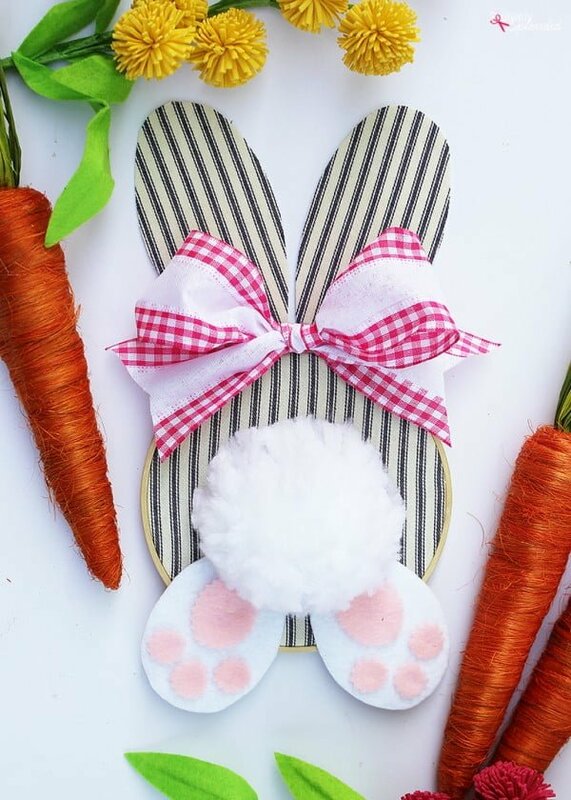 Free templates are provided to make this an easy Easter craft idea to create and enjoy. Follow this website to find out how to do it. 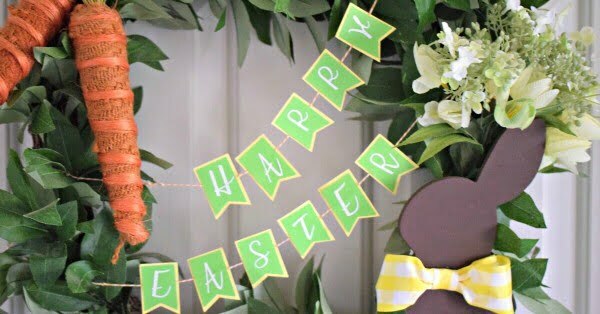 Make this easy DIY Easter wreath and paper Happy Easter Banner including a video tutorial to show you exactly how to make this cute banner. Check out the tutorial to see how to do it. 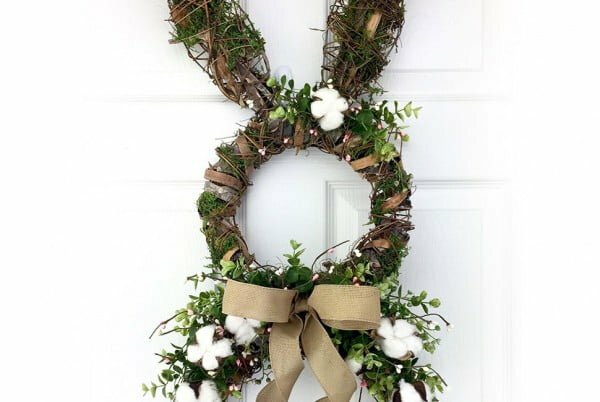 Add a festive touch to bunny hollow this year and create an Easter wreath. This easy craft will get your hands working and make the holiday even better. Read the tutorial for the entire plans and instructions. 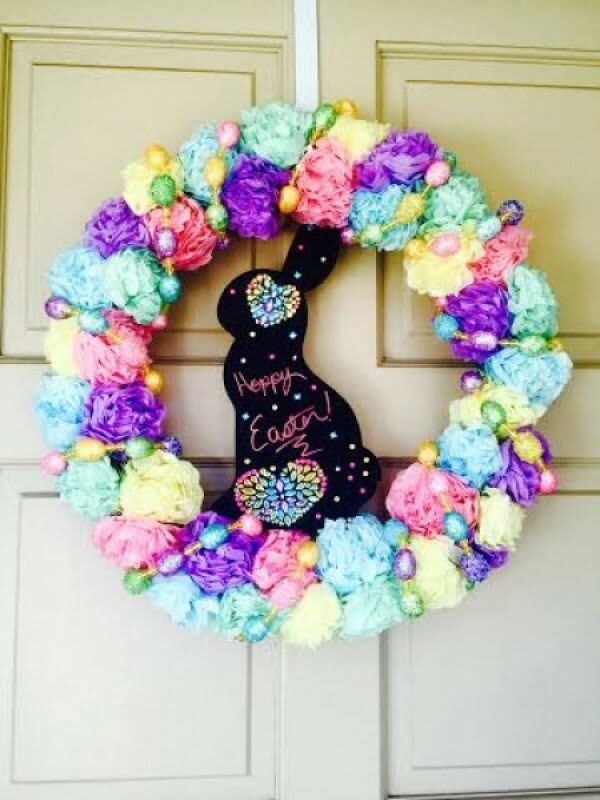 Create this DIY Easter wreath that you can replicate the easy way. Read the tutorial to learn how to do it. This wreath is so easy to make, even if you’ve never made a wreath before, you’ll be able to make this. Check out the link to find out how it’s done. 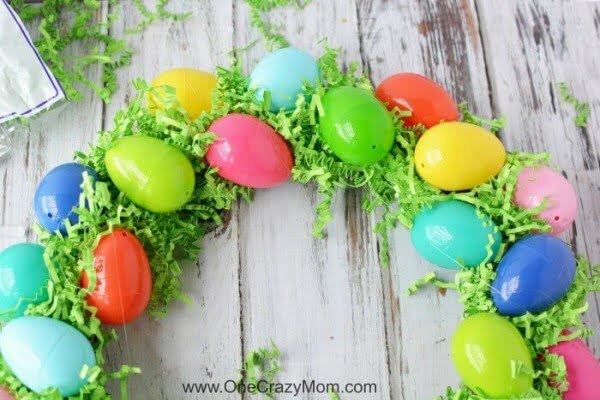 A step-by-step guide for a DIY Easter Egg Wreath using supplies found at home or cheap to buy – so easy anyone can make it. Read the article to get the entire guidance. Another small wreath for your kitchen area. This is an easy DIY wreath. 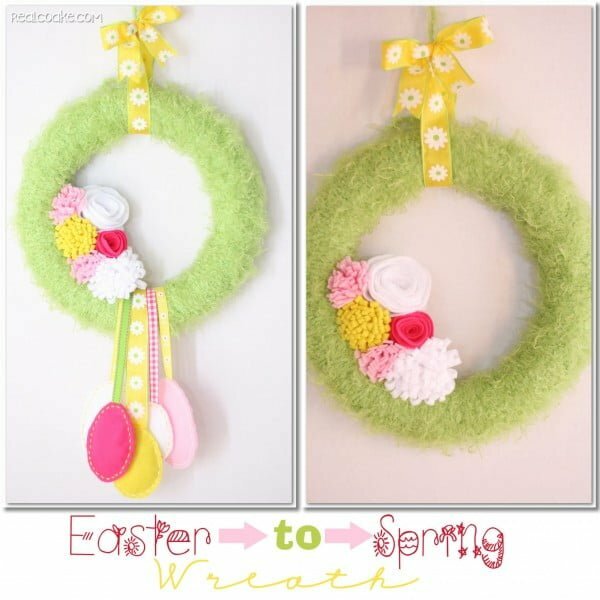 Add a little twist to the wreath to make it work for both Easter and spring. Check out the tutorial to get the full details. 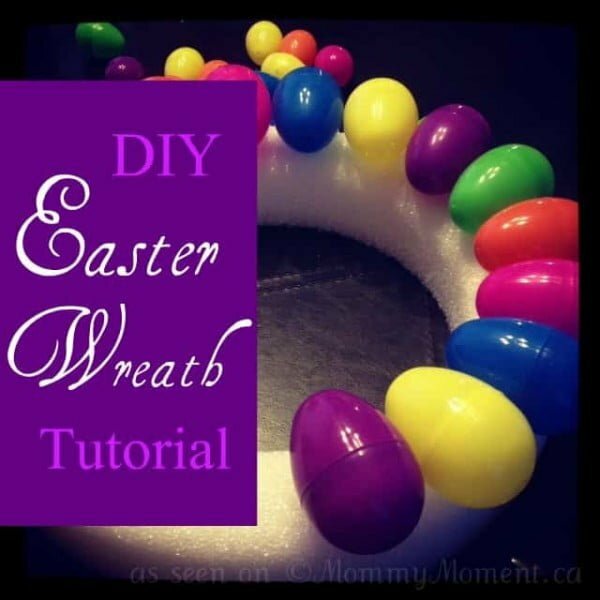 What an amazing DIY easter wreath tutorial on a budget. Follow the tutorial for the full details. 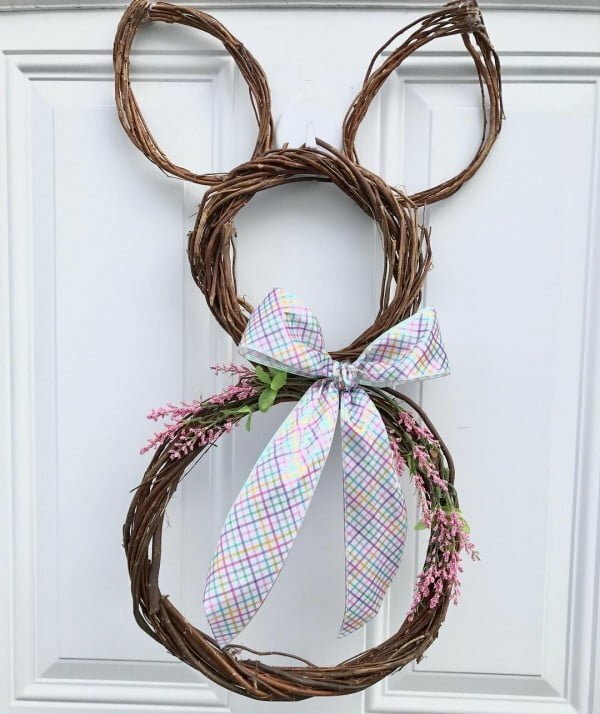 Looking for a DIY Disney Minnie Easter wreath that’s cute and inexpensive? Here’s a tutorial for the cutest wreath that’s a snap to make and under $11. Follow the link to see how it’s done. 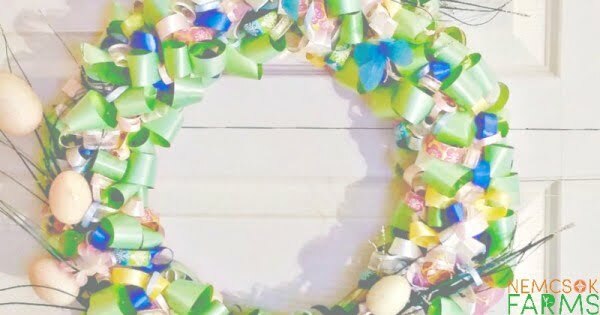 What an amazingly quick and easy DIY Easter wreath tutorial for a simple project. Follow this website to see the complete guidance. All the colors of Easter displayed on your front door. 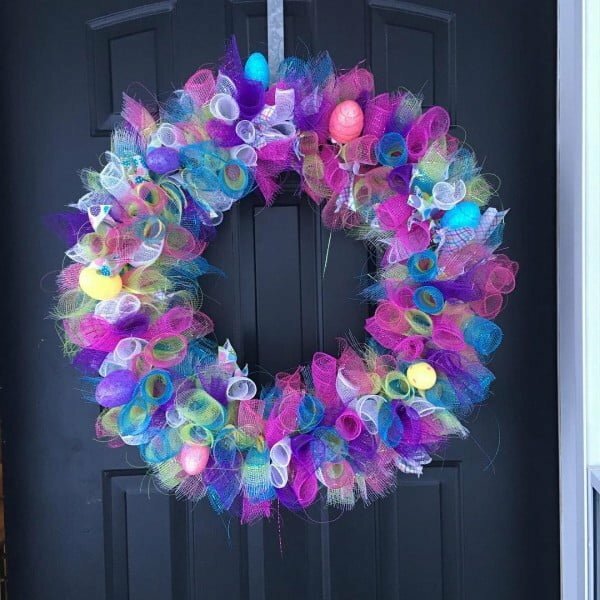 Follow along and see a unique technique for crafting the DIY Mesh Easter wreath. Check out the article to learn how to do it. 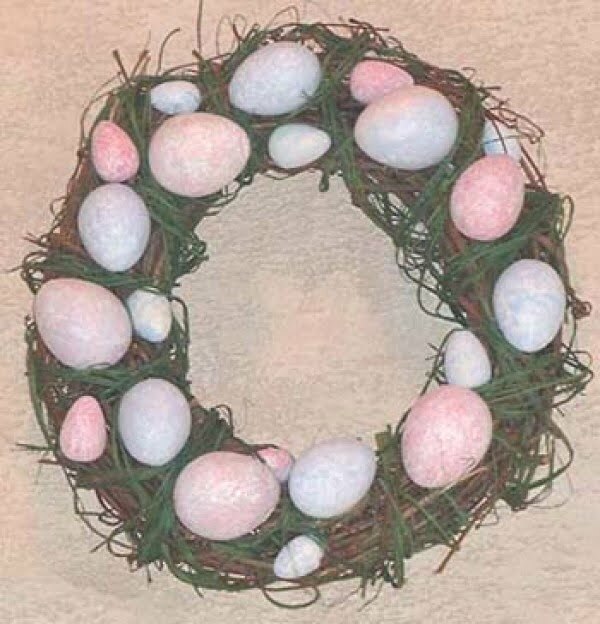 Decorate your garden with Easter Wreaths. Read the article to see the complete plans. Make this amazing DIY grapevine and burlap Easter egg wreath tutorial the easy way. Follow this website to see the entire guidance and instructions. 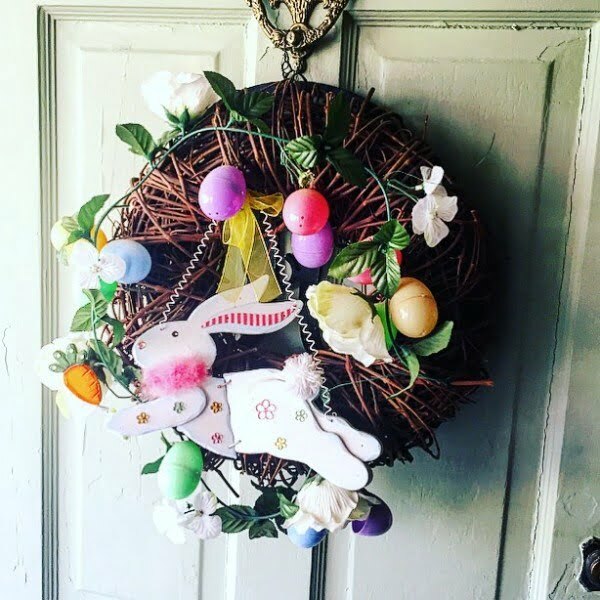 This easy Easter wreath idea is an easy embroidery hoop craft with foam eggs that you can put together in 15 minutes or less. Read the tutorial to learn how to do it. 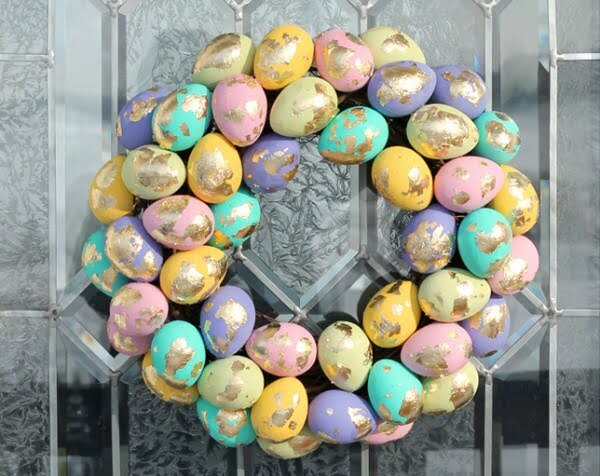 Cheerful pastel eggs are accented with an elegant speckled gold leaf technique on this DIY Easter wreath. 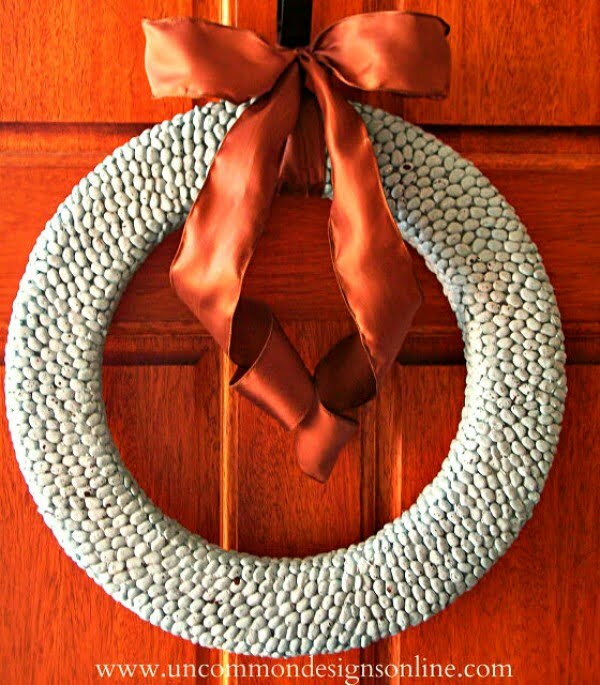 Welcome Spring with this festive door decor. See the article to see the complete guidance. 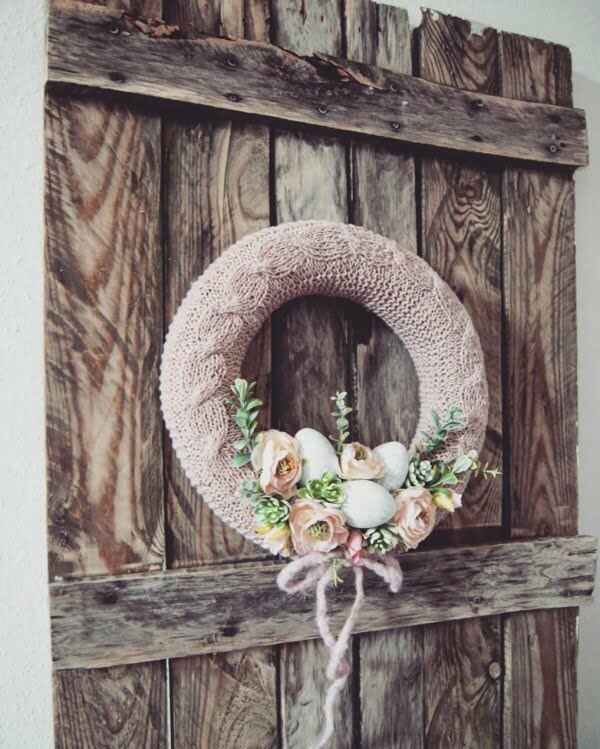 This Easter wreath brings a rustic element to the décor, with part of its material being reminiscent of burlap. The two-toned eggs add beauty and interest to the door. This gorgeous DIY Easter wreath is filled with beautiful colors reflecting the hues of spring. The beautiful pastel eggs inject elements of the period into the décor. 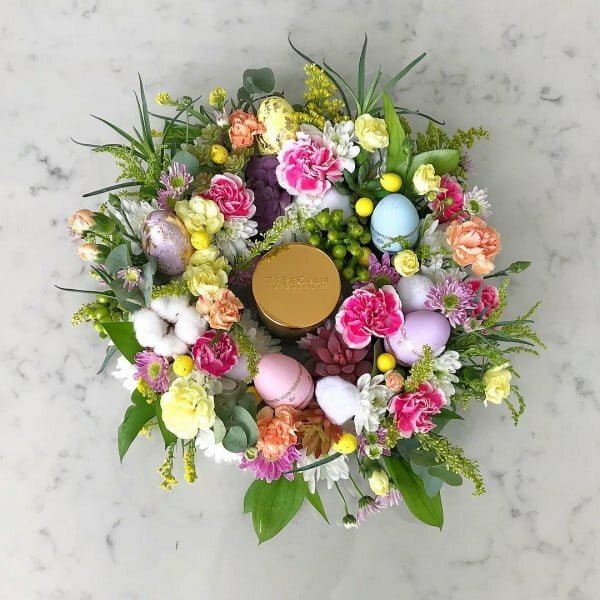 This fantastic arrangement exudes the look and feel of spring and Easter all rolled into one. The colors and other elements of the design combine to create visual awesomeness. This pastel work of art is understated in its beauty and will add exquisiteness to your door. The flowers and eggs perfectly complement the texture of the fabric used. 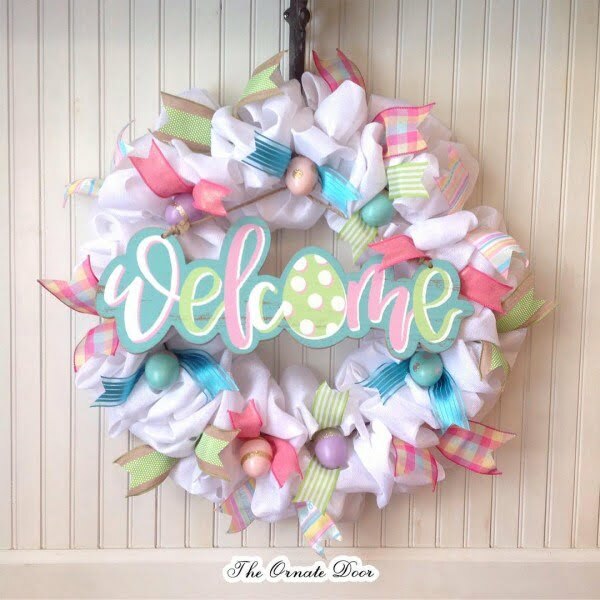 Everything about this wreath screams welcome; from the actual word to its colors and overall design. Springtime is personified in this work of art. 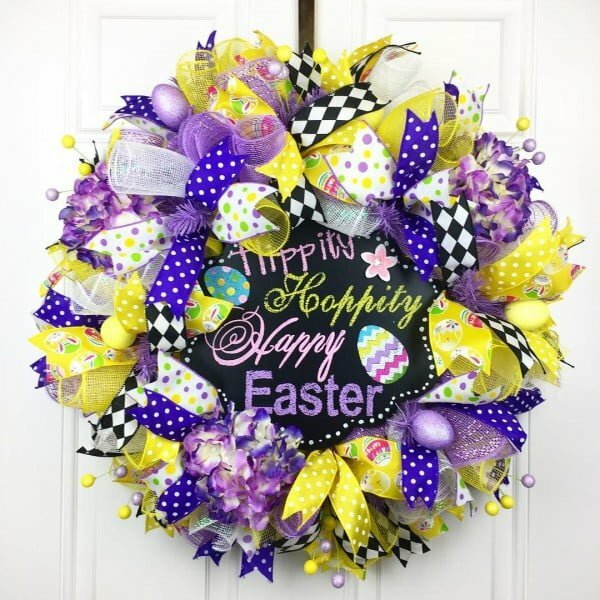 Having this visually stimulating wreath on your door is sure to fill all who enter your home with lots of hippity hoppity happiness. 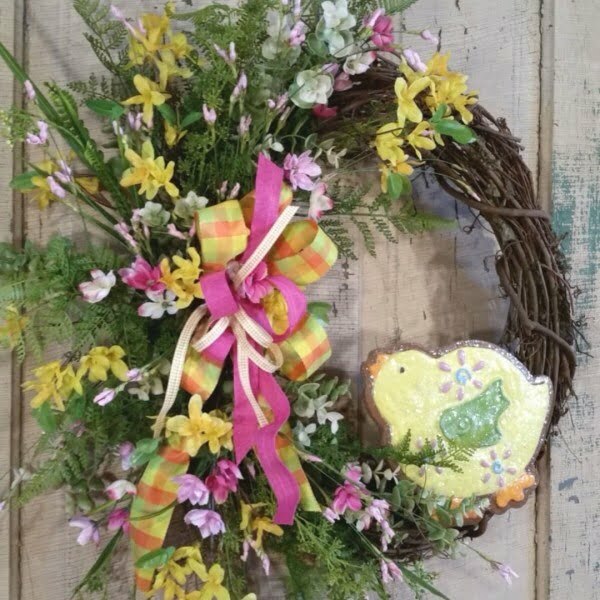 This intricately designed grapevine wreath is the perfect nesting place for this laid-back Easter chick. The delicate bows and flowers perfectly complement the firmness of the wreath. For many, there is nothing that says Easter quite as effortlessly as a bunny hopping over eggs. This creatively designed wreath truly reflects the spirit of the season. 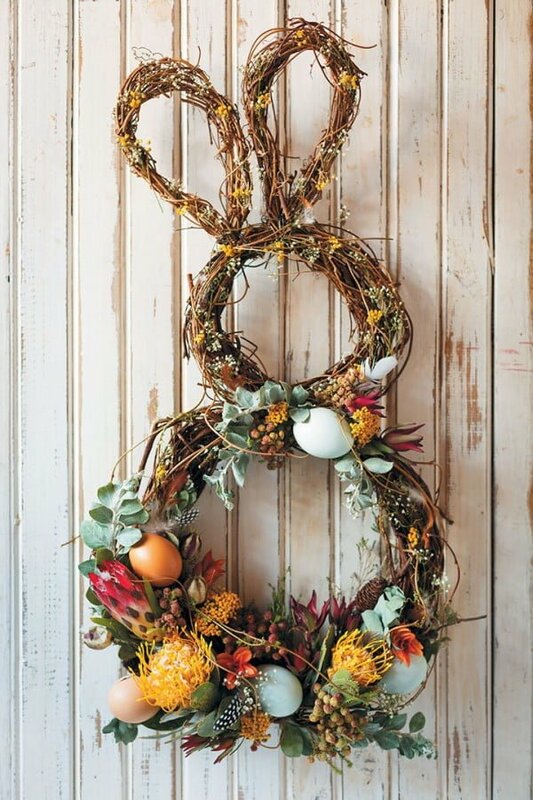 This exciting wreath is chock full of details that exude all things Easter. Its intricate features include a bunny and a wagon overflowing with great elements. This wreath is simply designed and yet rather superb in its elegance. Its purple elements provide the wreath with a regal look and feel and add much sparkle to the door. 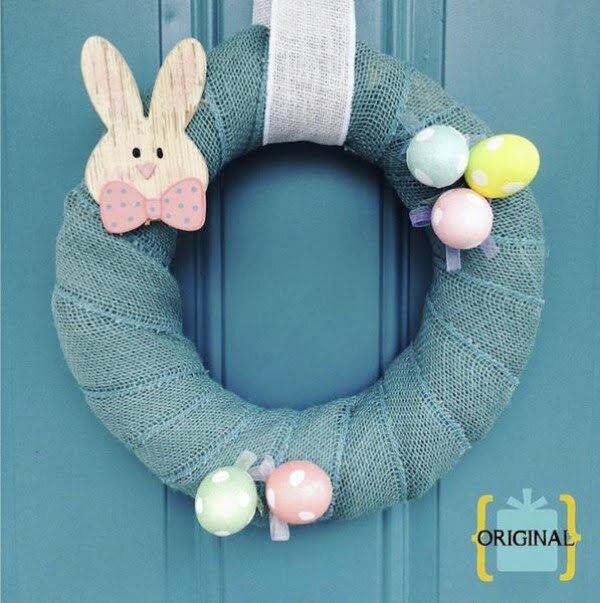 This bunny wreath provides an inexpensive way to beautify your door and provide your home with some welcoming Easter vibes. A bow and a few beautiful blooms combine to tie everything together perfectly. 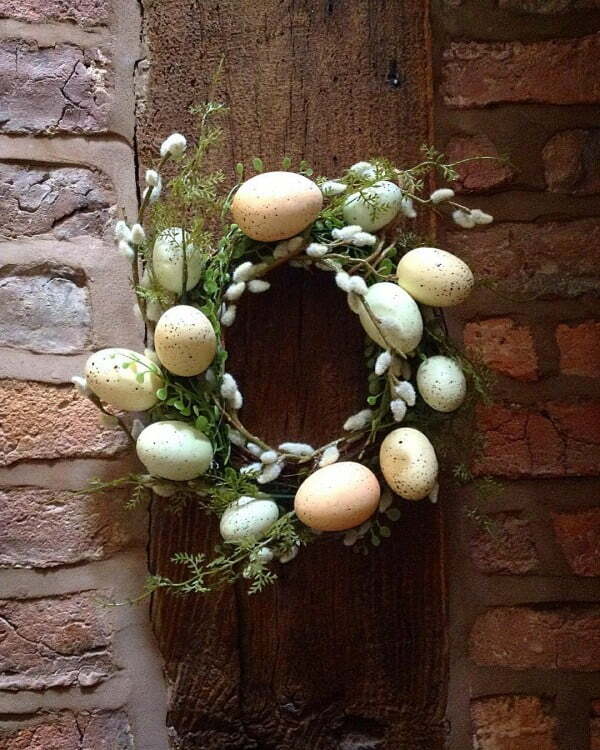 The eggs surrounding this wreath add depth and beauty to the door. The floral elements add a whimsical touch, and the white blooms add visual impact. 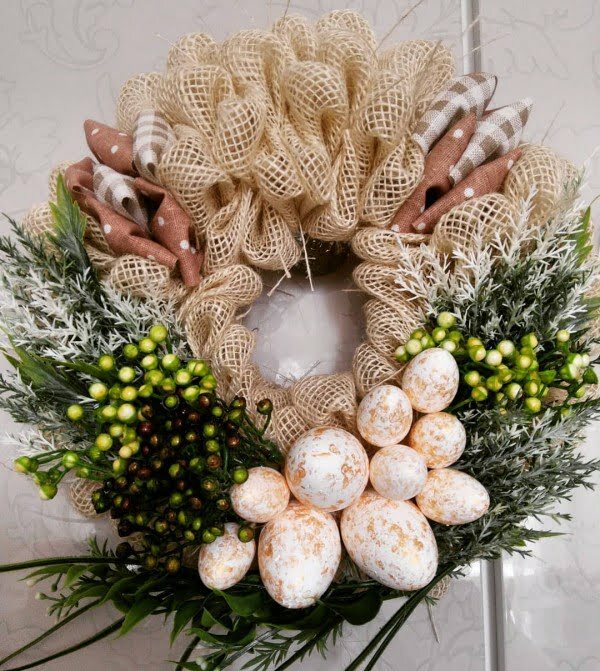 The exciting and innovating design of the Easter wreath is attention-grabbing and is a beautiful conversation piece. Creativity is wonderfully displayed in the single egg in the nest. 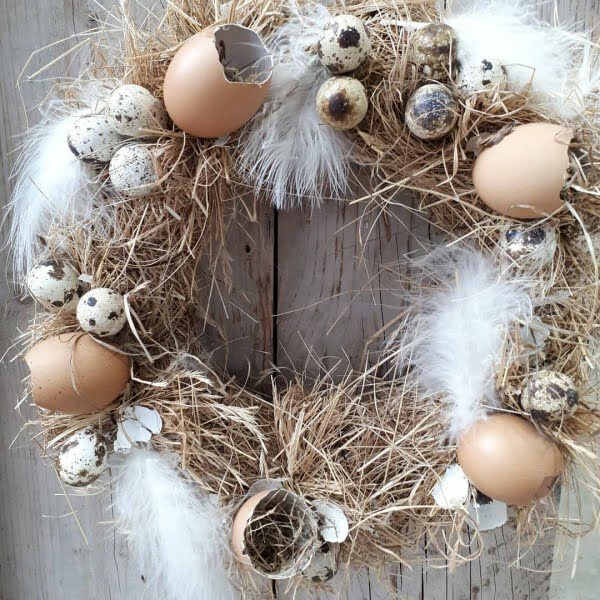 The cracked egg shells, speckled eggs and fluffy white feathers on this wreath come together for a fantastic creation that is sure to stimulate the senses. 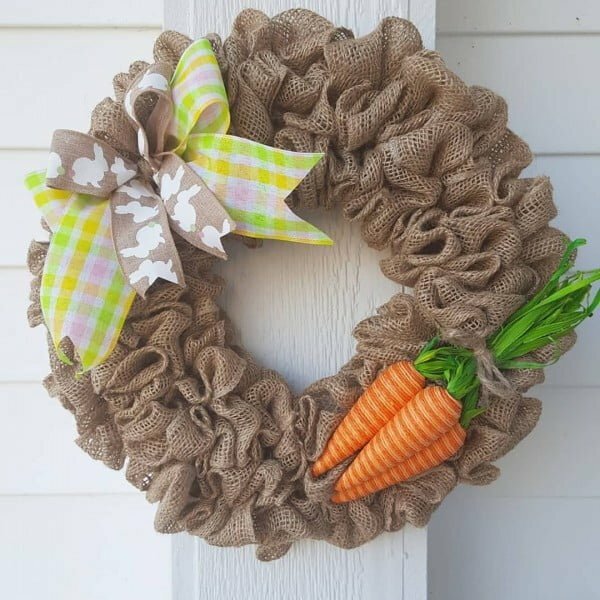 With just a bunch of carrots and two complementary bows, this burlap wreath is a testament to the fact that less is more. Its visual appeal is indisputable. 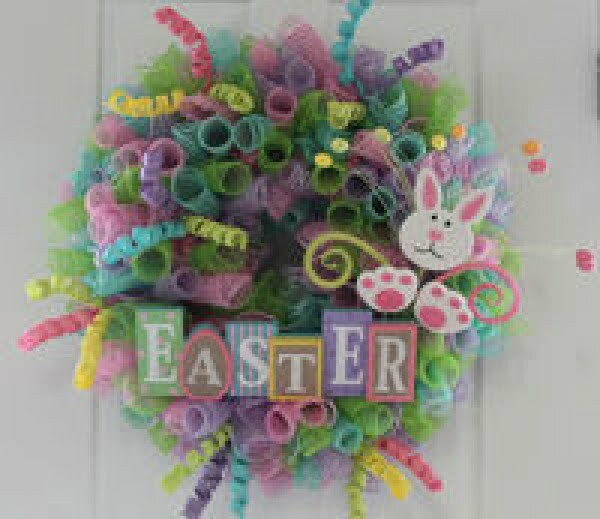 This beautiful Easter wreath is fun to create. You can make it an enjoyable project for you and your children or your nieces and nephews. 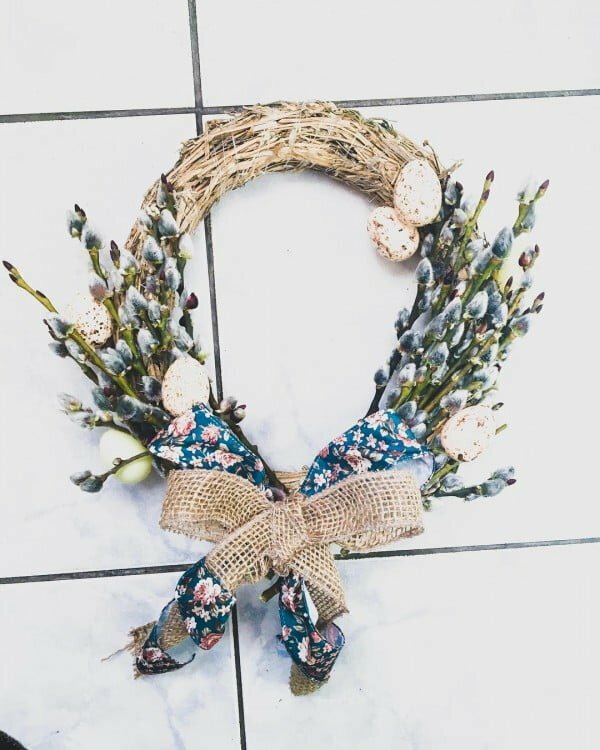 A bit of burlap, floral fabric, flowering blooms, and Easter eggs have transformed this wreath into a thing of undeniable beauty. Your door will benefit significantly from this addition. 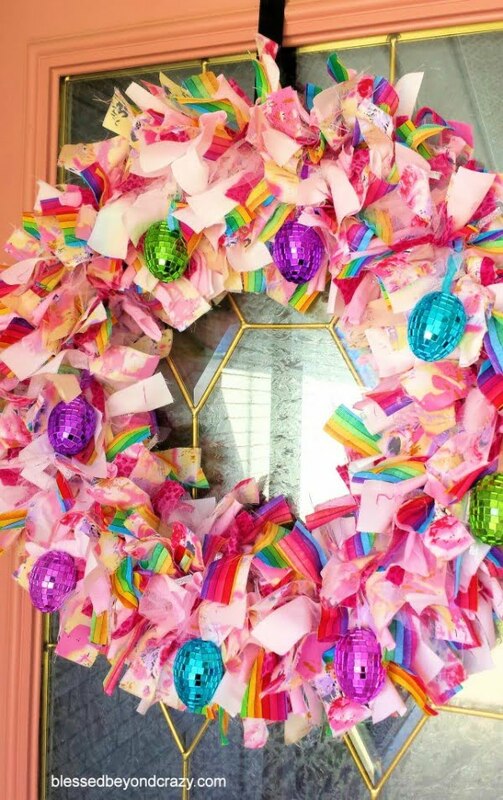 This super cute Easter wreath will instantly transform your door into a fun and festive vision of awesomeness. 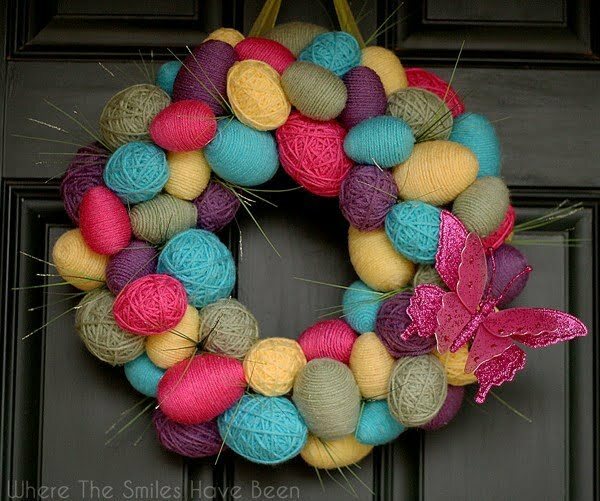 There is no denying the wondrousness of this wreath. 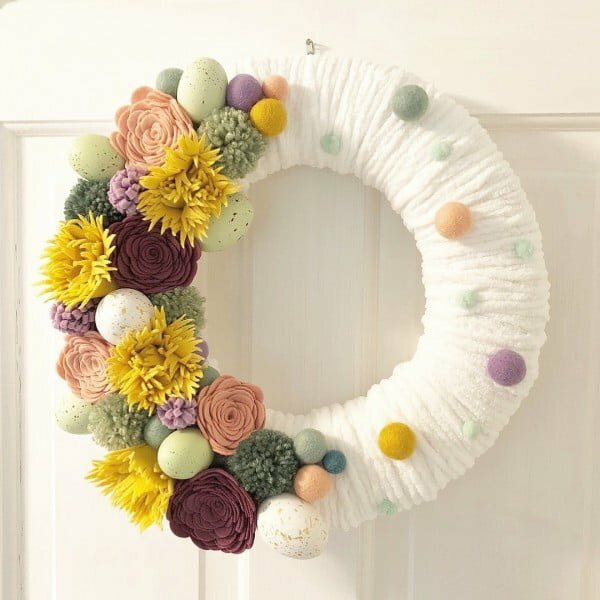 This cunningly crafted Easter wreath is the perfect complement for your front door and will provide an excellent way to welcome your guests. 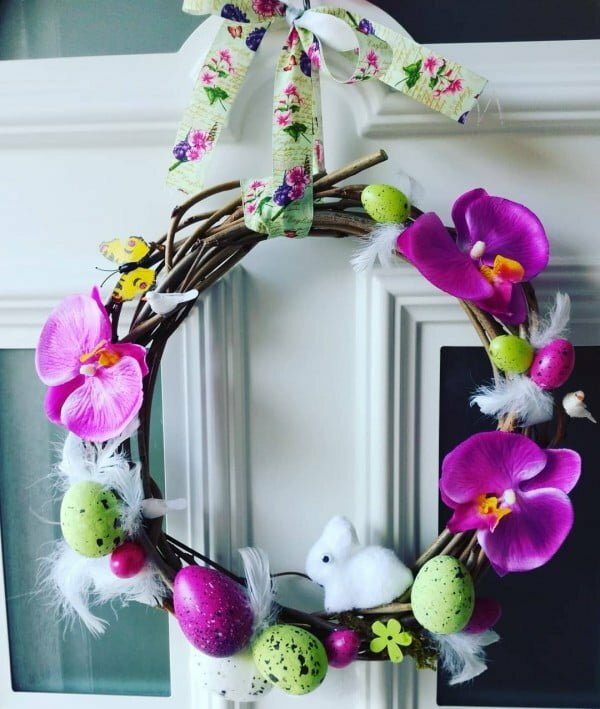 This stunning Easter wreath is sure to erase the memories of the drab weather of a season almost past and nurtures thoughts of warmer weather.